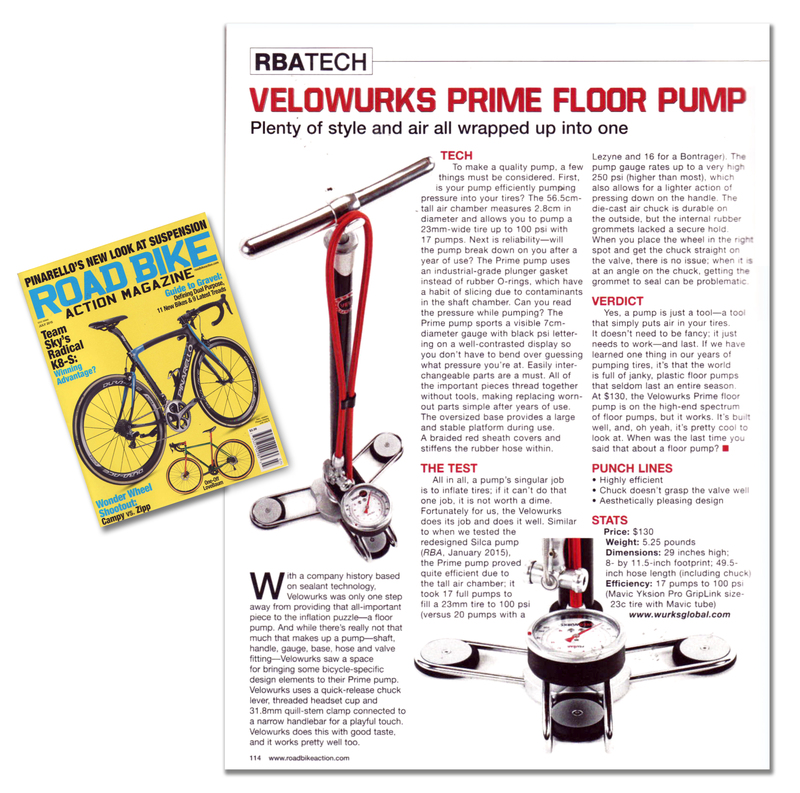 An instant classic, the Velowürks Prime floor pump blends modern functionality and convenience with Bauhaus design and tasteful, stylish touches from the golden age of cycling. 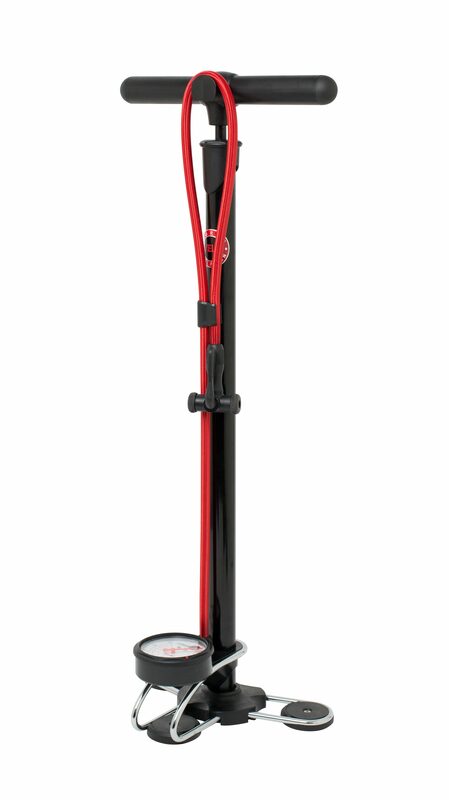 Hard anodized both inside and out for durability, the extra tall aluminum barrel puts less strain on your back while pumping and will inflate a 700c x 23 road tire to 100 psi in just 17 strokes. Track riders should note the 250 psi rating. 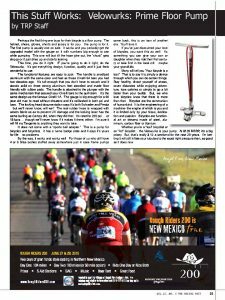 Long time cyclists are sure to recognize the stylish nods to classic components like the Italian bar and stem combo of the ergonomic handle and the campy QR pump head flip lever. Even the barrel top cap and rotating gauge bezel borrow their look from a classic headset lock ring. Just as style was part of the design process, the Prime was created with durability, functionality and maintenance in mind. All pressure facing components are threaded, not pressed together for higher tolerance fit and longevity. The oversized plunger is hard anodized for long life and passes through the top cap where oversized bushings ensure smooth action and extra durability. The plunger itself is not an o-ring but rather a replaceable heavy duty industrial grade rubber gasket ensuring years of trouble free use before needing replacement. 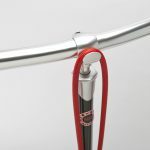 Extra long high pressure hose easily reaches bikes on work stands or racks and tucks away neatly on the integrated hose keeper hook and base retainer. 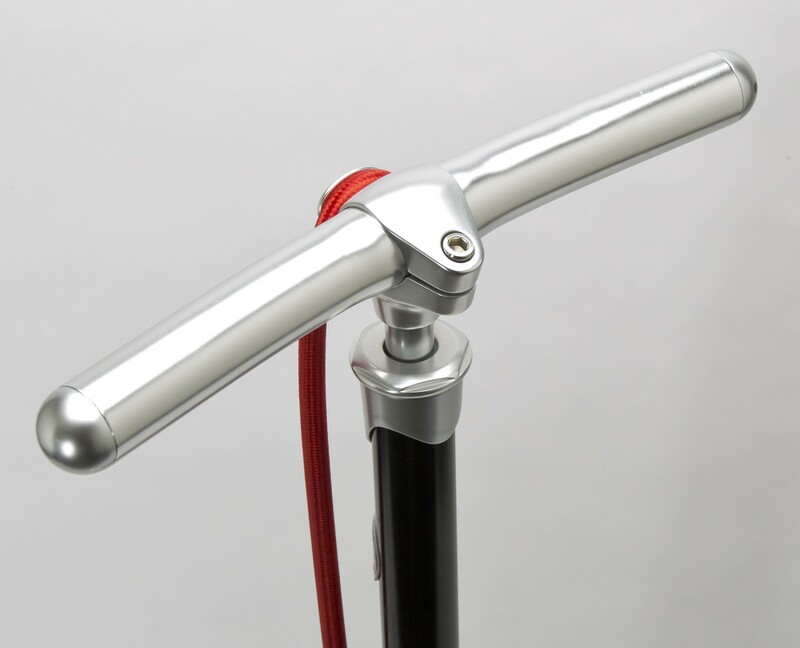 Bauhaus inspired bent rod base provides a stable three point stance to prevent the pump from tipping while protecting the oversized gauge from damage. The beauty, functionality and durability of the Prime ensures it will become a prized part of your shop equipment now and for years to come. This entry was posted in Floor Pumps, Velowurks and tagged Bicycle Inner tube, Bicycle Tire, bike pump, Flat repair, Flat tire prevention, Flat tire repair, floor pump, inflation, Joeblow, Lezyne, pump, Road bike, silca, Super pista, tire inflation, Topeak, Velowurks Prime on October 8, 2016 by Marlow. 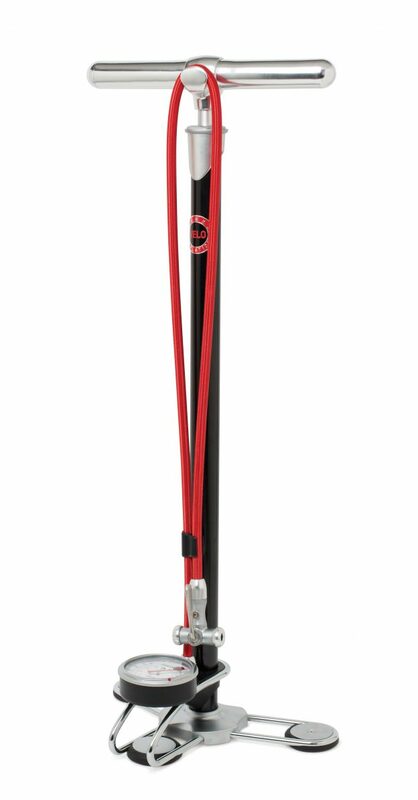 Rooted in the “form follows function” Bauhaus school of design with touches of classic Italian components, the Element floor pump delivers big time performance with durability for the long haul. Fully rebuildable and rated to 160 psi, the Element features an extra tall steel barrel that moves more air per stroke without straining your back. 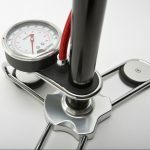 The wide, Bauhaus inspired bent rod tripod base provides extra stability against tipping over and helps protect the oversized, easy-to-read gauge. 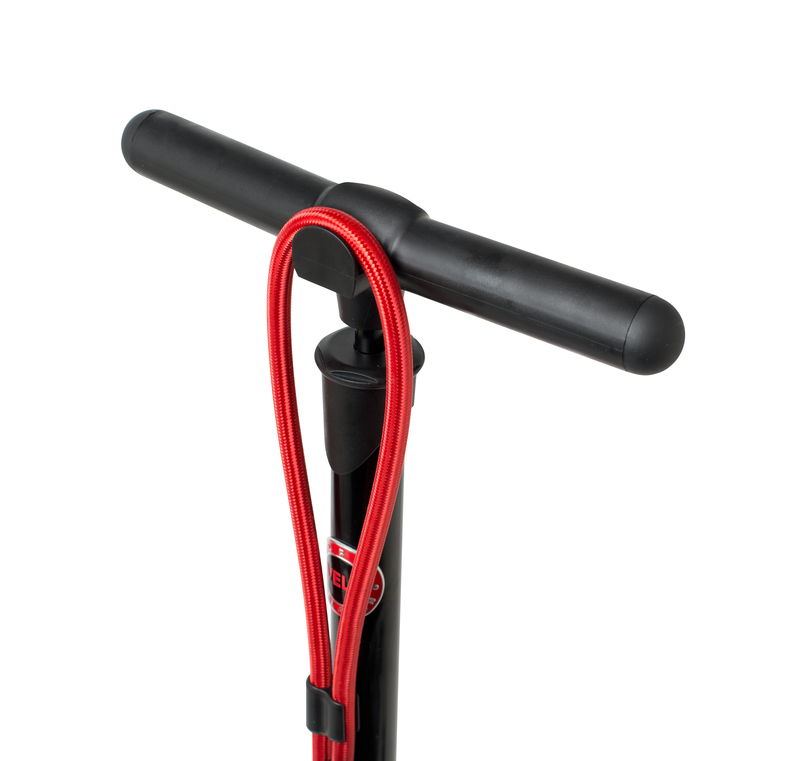 Extra long hose easily reaches bikes on work stands or bike racks and stores away neatly on the integrated hook and base keeper when not in use. Reinforced composite dual pump head fits both presta and schrader valves without swapping parts and features a Campy QR inspired flip lever. Extra long high pressure hose reaches works stands and bike racks. This entry was posted in Floor Pumps and tagged bicycle floor pump, bicycle tire inflation, flat tire, floor pump, inflation, Presta valve, Schrader valve on October 7, 2016 by Marlow. 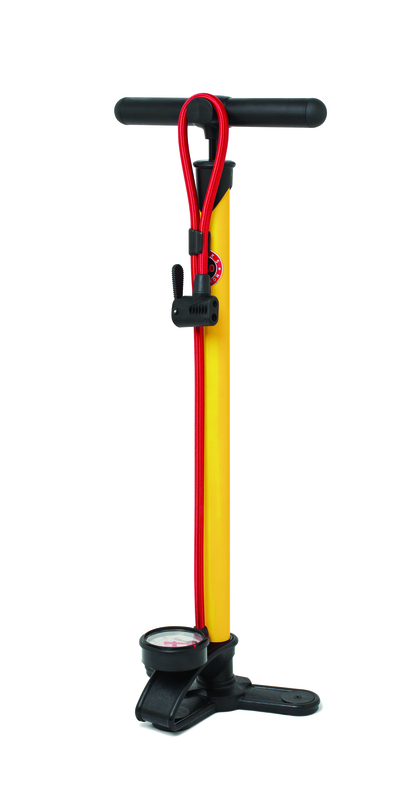 Tough, dependable and fully rebuildable, the Indy represents a great value in floor pumps. 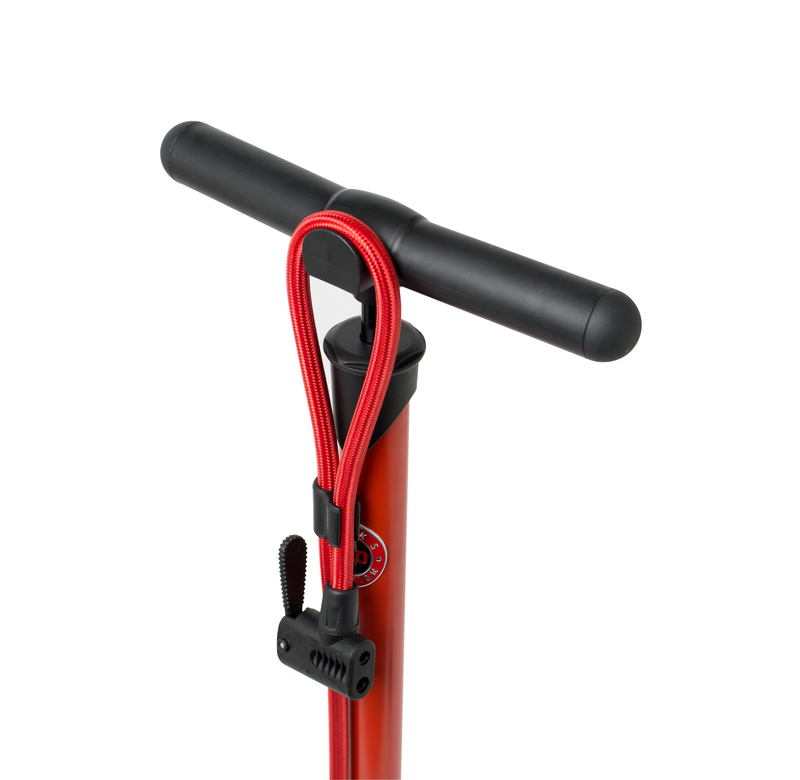 With category leading features like a tall steel barrel with replaceable internals the Indy quickly inflates tires up to 160 psi while the wide tripod base keeps things stable while pumping. Large, 2.5″ gauge for precise inflation and long, high pressure hose with dual head fits both Presta and Schrader valves without swapping out parts. Ergonomic handle fits comfortably in your hands and features an integrated hose keeper to store the hose when not in use. 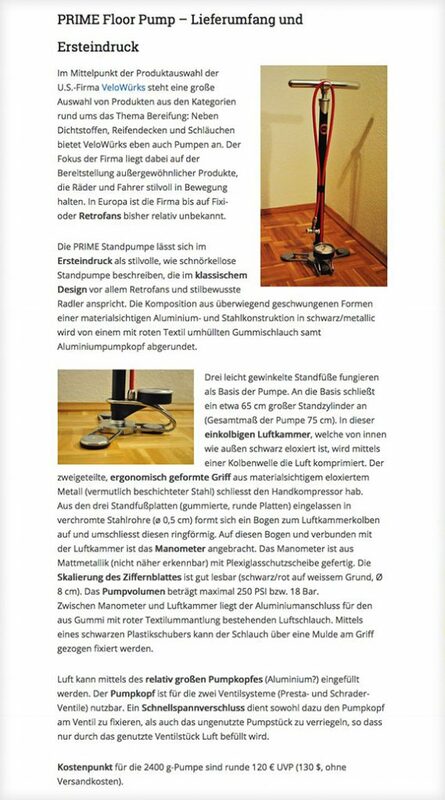 This entry was posted in Floor Pumps, Velowurks and tagged Bicycle, bicycle floor pump, Bicycle Inner tube, bicycle tire inflation, Flat tire repair, floor pump, Joeblow, Lezyne, pump, silca on October 6, 2016 by Marlow. 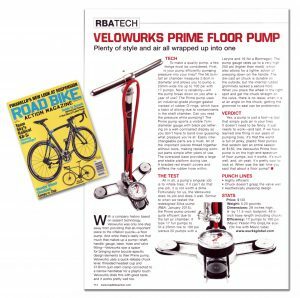 With a company history based in sealant technology, Velowurks was only one step away from providing that all-important piece to the inflation puzzle—a floor pump. 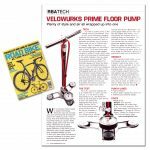 And while there’s really not that much that makes up a pump—shaft, handle, gauge, base, hose and valve fitting—Velowurks saw a space for bringing some bicycle specific design elements to their Prime Pump. 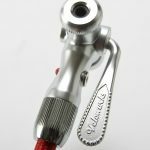 Velowurks uses a quick-release chuck lever, threaded headset cup and 31.8mm quill-stem clamp connected to a narrow handlebar for a playful touch. Velowurks does this with good taste, and it works pretty well too. To make a quality pump, a few things must be considered. First, is your pump efficiently pumping pressure into your tires? The 56.5cm-tall air chamber measures 2.8cm in diameter and allows you to pump a 23mm-wide tire up to 100 psi with 17 pumps. Next is reliability—will the pump break down on you after a year of use? The Prime Pump uses an industrial-grade plunger gasket instead of rubber O-rings, which have a habit of slicing due to contaminants in the shaft chamber. Can you read the pressure while pumping? 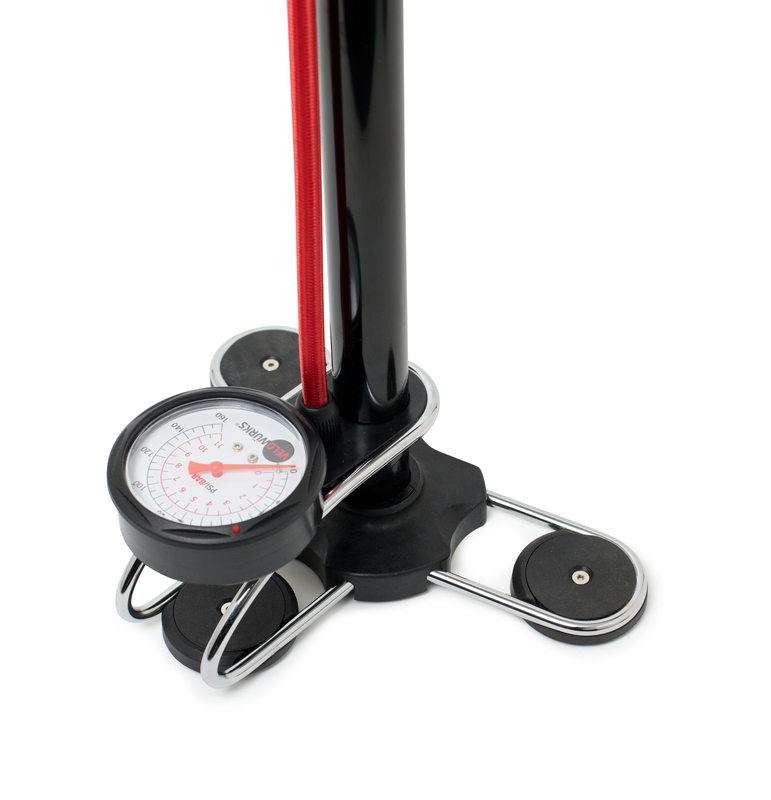 The Prime Pump sports a visible 7cm-diameter gauge with black psi lettering on a well-contrasted display so you don’t have to bend over guessing what pressure you’re at. Easily inter-changeable parts are a must. All of the important pieces thread together without tools, making replacing worn-out parts simple after years of use. The oversized base provides a large and stable platform during use. A braided red sheath covers and stiffens the rubber hose within. All in all, a pump’s singular job is to inflate tires; if it can’t do that one job, it is not worth a dime. Fortunately for us, the Velowurks does its job and does it well. 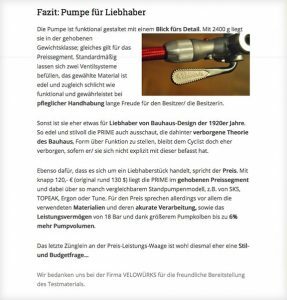 Similar to when we tested the redesigned Silca pump (RBA, January 2015), the Prime Pump proved to quite efficient due to the tall air chamber; it took 17 full pumps to fill a 23mm tire to 100 psi (versus 20 pumps with a Lezyne and 16 for a Bontrager) The pump gauge rates up to a very high 250 psi (higher than most), which also allows for a lighter action of pressing down on the handle. The die-cast air chuck is durable on the outside, but the internal rubber grommets lacked a secure hold. When you place the wheel in the right spot and get the chuck straight on the valve, there is no issue; when it is at an angle on the chuck, getting the grommet to seal can be problematic. Yes, a pump is just a tool—a tool that simply puts air in your tires. It doesn’t need to be fancy; it just needs to work—and last. If we have learned on thing in our years of pumping tires, it’s the the world is full of janky, plastic floor pumps that seldom last an entire season. At #130, the Velowurks Prime floor pump is on the high-end spectrum of floor pumps, but it works. It’s built well, and oh yeah, it’s pretty cool to look at. When was the last time you said that about a floor pump? 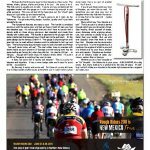 This entry was posted in Floor Pumps, Reviews, Velowurks and tagged Bicycle, Bicycle Inner tube, floor pump, inflation, Joeblow, Lezyne, Prime Review, pump, Road bike, tire inflation on June 7, 2016 by Marlow. Perhaps the first thing one buys for their bicycle is a floor pump. The helmet, shoes, gloves, shorts and jersey is for you – the pump is for it. The first pump is usually one on sale. It works and you probably get the upgraded model with the gauge on it with numbers big enough to see while pumping. This one will last till the hose gives out, the “chuck” gets sloppy or it just dries up and starts leaking. This time, you do it right. IF you’re going to do it right, do the Velowurks. It’s got everything design, function, quality and it just feels wonderful to use. The functional features are easy to spot. 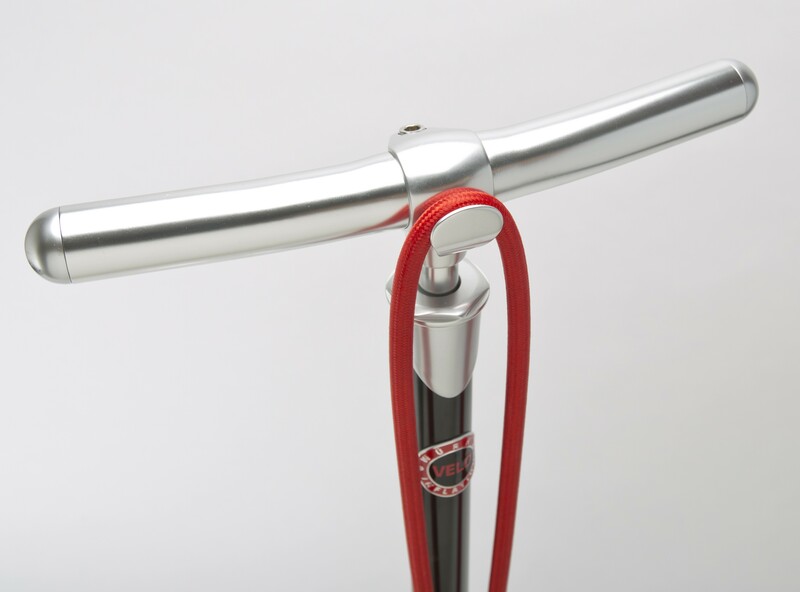 The handle is anodized aluminum with the same color and feel as those Cinelli 64 bars you had two decades ago. It’s tall enough that you don’t have to crouch and it stands solid on three strong aluminum feet steadied and made floor friendly with rubber pads. 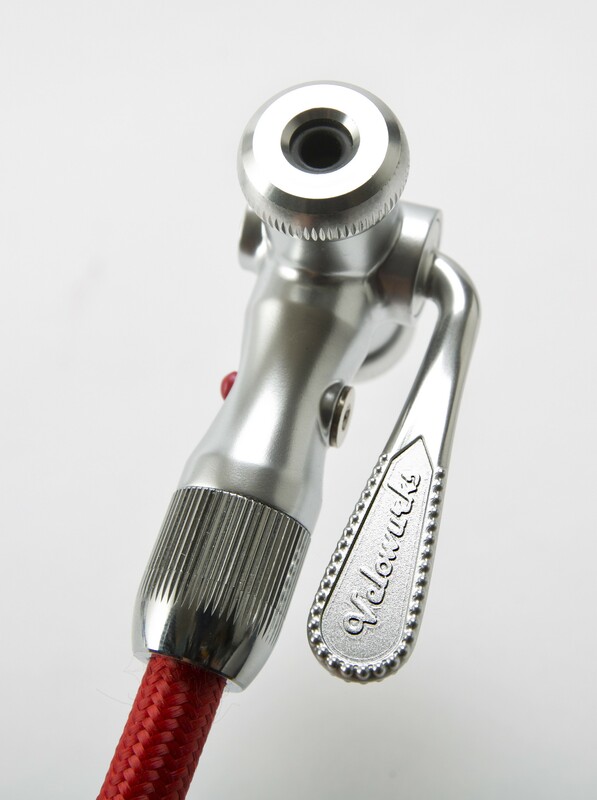 The handle is attached to the plunger with the same mechanism that secured your Cinelli bars to the quill stem. It’s the same design as the famous Cinelli 1A. The gauge is big enough for a 60 year old man to read without cheaters and it’s calibrated in both psi and bars. The locking head documentation says it’s both Schrader and Presta but we’ll never know, will we? The real rubber hose is wrapped with woven fabric so as to prevent UV damage and the locking lever has the same nurling as Campy did, when the did that. It’s rated 250psi … or 18 bar … though we’ll never know if it makes it there, either. I’m sure it will fit my Tangente to anything they want to take. It does not come with a “sports ball adapter.” This is a pump for bicycles and bicyclists. It has a name badge plate and it says it’s yours for life no problems. By the way, it works and works well. For those of us who still have 4 or 6 Silca bodies stuffed away somewhere just in case frame pumps come back, this is an icon of another era. You’ll love it. If you’ve just discovered your love of bicycles, you want this as well. It’s something you can give your son or daughter when they ride their first century or take first in the local crit – maybe your grandkids. Many will tell you “Your bicycle is a tool”. That is to say it is simply a device through which you can do certain things. Stay healthy, divest yourself of stress, cover distances while enjoying adventure, lose calories or simply to go a bit faster than your buddy. But, we who love bicycles know that there is more than that. Bicycles are the communion of humankind. It is the engineering off a machine – the engine of which is you and it limited only by your focus, dedication and passion. Bicycles are functional art or dreams made of steel, aluminum, carbon fiber or titanium. 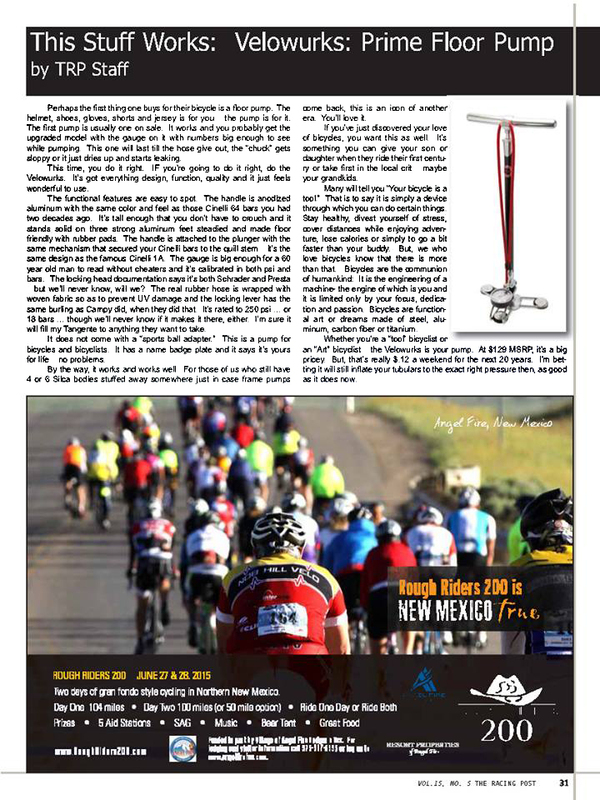 Whether you’re a “tool” bicyclists or an “Art” bicyclist – the Velowurks is your pump. At $129 MSRP, it’s a big pricey – But that’s really $ .12 a weekend for the next 20 years. I’m betting it will still inflate your tubulars to the exact right pressure then, as good as it does now. This entry was posted in Reviews, Velowurks and tagged Bicycle, Bicycle Inner tube, Bicycle Inner Tubes, bike pump, Flat repair, flat tire, Flat tire prevention, Flat tire repair, floor pump, inflation, Joeblow, Lezyne, Prime Review, pump, silca, Super pista, Topeak, Velowurks Prime on June 6, 2016 by Marlow. The pressure has to be right! Otherwise it rolls badly or, at worst, just not at all. 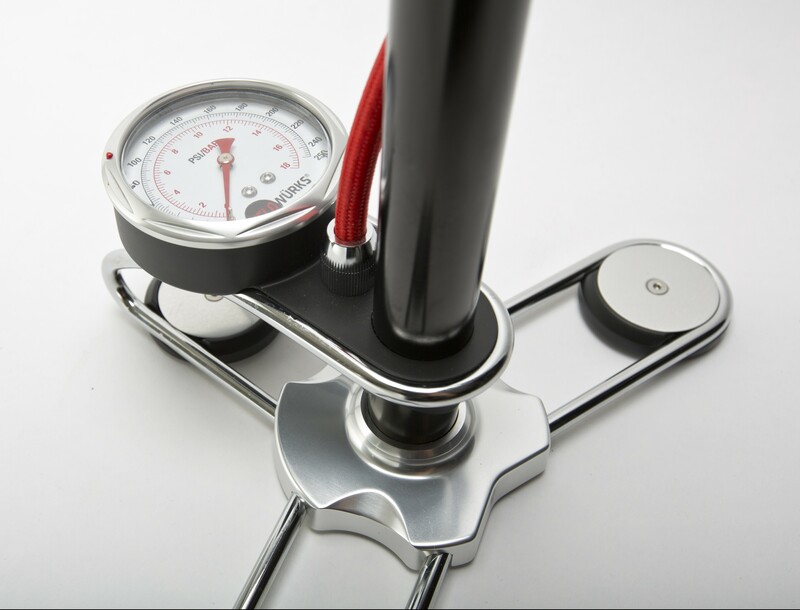 While traveling small hand compressors quasi part of the basic equipment of a cyclist, a good and qualitative floor pump for the necessary pressure in the tires should home care. 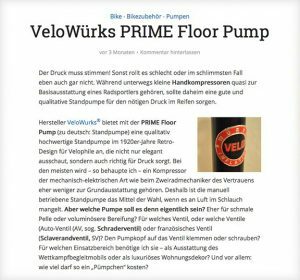 Manufacturer VeloWurks® provides the PRIME Floor Pump (in German: floor pump) a high-quality floor pump in 1920s retro design for Velo Phile, which looks not only elegant, but also provides for the right pressure. Most will – as I say – a compressor of the mechanical-electrical type rather less include how the bicycle mechanic of confidence as standard. Therefore, the manually operated floor pump is the drug of choice when there is a lack of air in the tube. But which pump should it be about? Rather for narrow Pelle or voluminous tires? Which valve, or which valves (Auto valve (AV, called Schrader valve) or French valve (Sclaverandventil, SV) clamp or screw the pump head onto the valve for which area of application do I need it.? 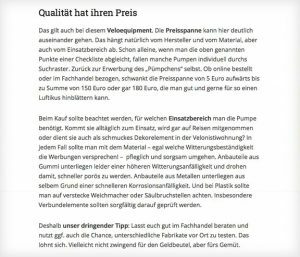 – As amenities competition accompanying motorhome or a luxury apartment decor And above all: how much should cost as a “Pumpchen”? 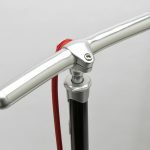 Almost every well-known manufacturers in the bicycle industry has different stand pumps in its range. And keep coming back for news in this category of Radequipments on the market. As with many other cycling products also applies for floor pumps including the slogan “You are spoiled for choice”. In order to shorten the agony a little to ease the buying decision a little and show even so some pitfall, here are some useful hints and tips. 1. valve heads. Just this play an important role in the purchasing decision. Because the valve is built not only on what the pump head is required, but also which pump power would be generated with the floor pump. The “classic” Sclaverandventil, the so-called. French valve or valve Road, for example, requires a rim bore of 6.5 mm and holds a maximum pressure of 15 bar was. Due to its design, this valve is particularly suitable for tires with high tire pressure, such as common in racing bikes, suitable. The pump head is opening – valve design requires – just 4 mm tall. The Schrader or Presta contrast, has a rim bore of 8.5 mm and up to 6 bar loads. This bicycle valve is used as standard in cars and is therefore also known as the Auto Valve or AV valve known. The clear advantage of this valve: it can be filled at any gas station with the existing systems. The pump head opening is here wider (5mm, but not so deep and has a mandrel in the middle, with the valve or the air flow is regulated. Installed AV valves are widely used in mountain bikes (Enduro, All Mountain). Ergo: who is with a mountain bike, hardly needs an air pump, which could force up to 20 bar in the tires. The opposite holds for racing cyclists and Crosser, which should favor such a model when pumping purchase. Ensure you should also ensure that they can cope with the pump, since the operating forces to a safe should. 2. The pump head. Many stand pumps offer but to also be suitable for both the service standard valve types. This either through an adapter or a double-sided pump head. 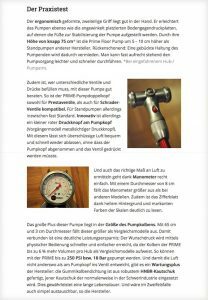 Decisive for combi pump heads: is screwed or jammed? The pump head itself should be first processed tight. The best of a piece, so a part of which nothing can break. The recording of the valve – clamped or screwed – depends primarily on the type of valve. But also on the variability of the insert. Added to this comes the processing and the chosen material of the pump. 3. The material. The materials are PVC / rubber blends will find chrome and nickel-plated steel as well again as div. Rubber compounds and textile or even wood and cork. The designers draw here their creative potential to the full. It is useful also if you know how much pressure at all in the tires. For this purpose a pressure gauge on the pump is essential 4th. And the latest NOW separates the product offering wheat from the chaff. Because literally large differences exist in the size and design of the dial. Whether slender, too small, only a scaling calibrated (bar / psi) or even simply inaccurate – here you should look really accurate. Last but not least should not be forgotten in addition to these technical factors also 5. ergonomics. For at least as important as the use of the product are its dimensions. For example, the height – the pump is individually rather too high or too low? How is the handle – engages it pleasant or you have after two strokes already calluses on his palms? Oh and the stability! Wackelt the pump light at each touch or is it solid and firmly on the ground? These are all aspects that often make the small but important difference between Pleasure and Pain (can). This is also true in this running gear. The price range can go far apart here. This depends on the manufacturer and the material, but also on the operation environment. Already alone when one compares the points of a checklist above, some pumps falling individually through the search grid. Back to the acquisition of “Pümpchens” itself. Whether ordered online or obtained commercially, the price range of 5 Euro fluctuates upwards to the sum of 150 Euro or even 180 euros that you like may well and shell out for such a windbag. Buyer should be noted, for which application area is required for the pump. If they routinely used, is even taken on trips or even used them as schmuckes decorative element in the Velonistiwohnung? In any case, go with the material – no matter which promise weatherability the ads! – Care and thrifty. Parts of rubber are unfortunately a higher climatic vulnerability and threaten to become faster porous. Parts of metals subject for the very same reason a faster corrosion susceptibility. And when plastic should pay attention to hide plasticizers or Säulbruchstellen. In particular, composite elements should be carefully examined it. Therefore, our urgent Tip: Let you good advice in stores and uses possibly also the chance to test different makes on site. It’s worth it. Maybe not necessarily on the wallet, but for the mind. The entire product range of the U.S. firm drive is a large selection of products from the categories around the theme Tires: Besides sealants, tire casings and tubes VeloWürks has just also pumps. The Company’s focus is on providing exceptional products, keep the wheels and driver style in motion. In Europe, the company is up to Fixi- or retro fans hitherto relatively unknown. The PRIME floor pump can be the first impression as stylish as describe uncluttered floor pump which is especially appealing to fans and retro style-conscious cyclists in classic design. 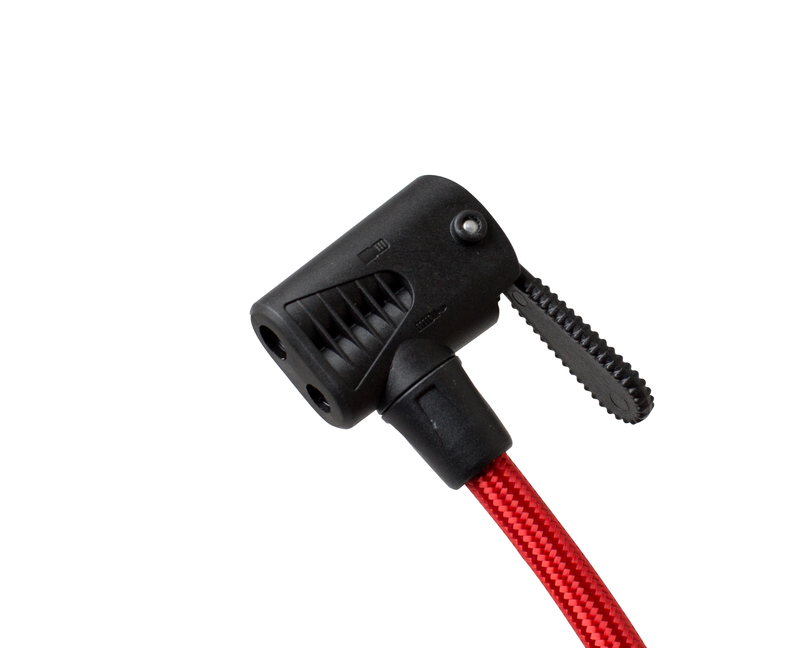 The composition containing predominantly curved forms a materialsichtigen aluminum and steel structure in black / metallic is complemented by a covered with red textile rubber hose including aluminum pump head. Three slightly angled feet act as the base of the pump. At the base includes about 65 cm large standing cylinder at (aggregate measure of the pump 75 cm). In this einkolbigen air chamber, which is black anodized from inside and outside, the air is compressed by a piston shaft. The two-part, ergonomic handle materialsichtigem anodized metal (presumably coated steel) closes the hand compressor hab. From the three base plates (rubber, round plates) embedded in chromed steel tubes (ø 0.5 cm) to a sheet formed on the air chamber piston and surrounds this annular. On this sheet and connected to the air chamber, the pressure gauge is attached. The gauge is made Mattmetallik (not shown in greater detail) gefertig with plexiglass windshield. The scaling of the dial is easy to read (black / red on a white ground, Ø 8 cm). The pumping volume is a maximum of 250 PSI or 18 bar. Between pressure gauge and air chamber of the aluminum connector is for the air hose of rubber existing with red Textilummantlung. 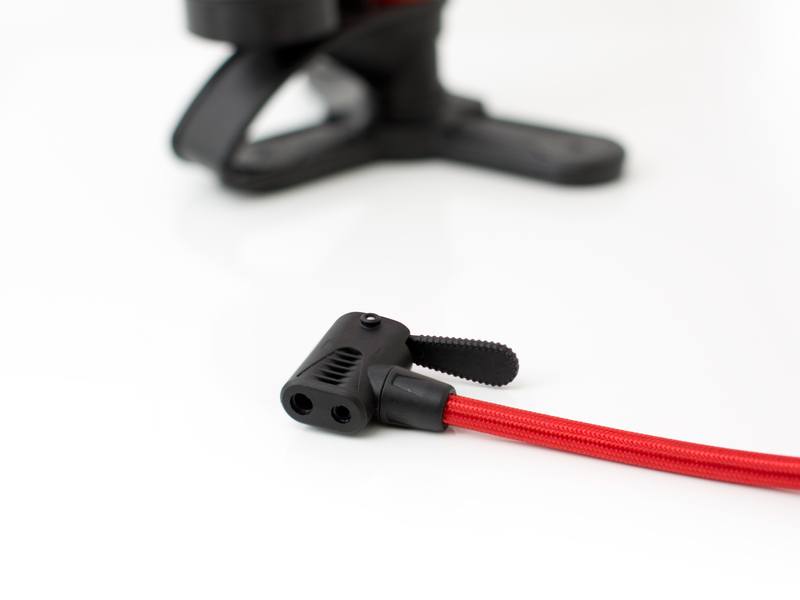 Using a black plastic slipcase, the hose can be fixed pulled over a depression on the handle. Air, by means of the relatively large pumping head (aluminum?) Are charged. 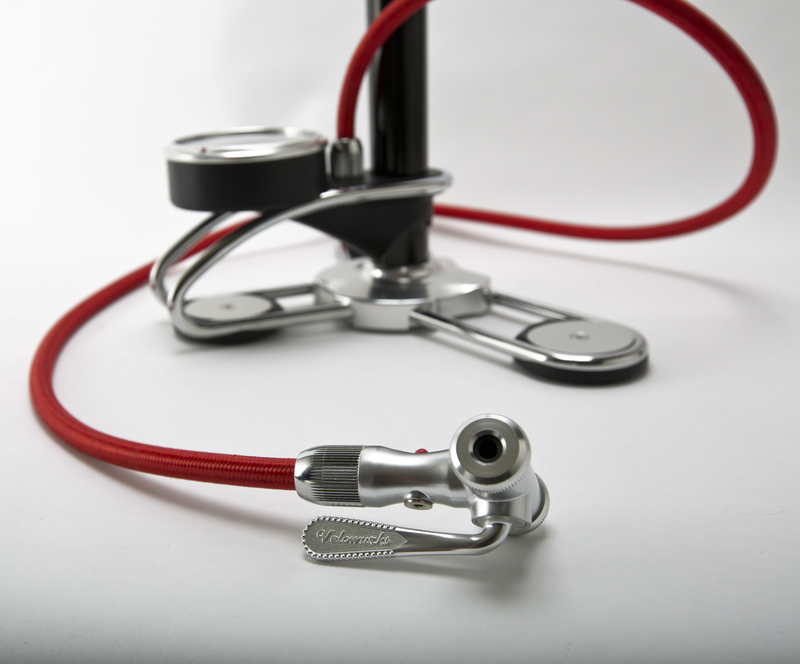 The pump head is available for the two valve systems (Presta and Schrader valves). A quick-locking device serves both to fix the pump head on the valve, as well as to lock the unused pumping piece, is so filled only by the used valve piece air. Cost point for the 2,400 g pump are round € 120 MSRP ($ 130 without shipping costs). The ergonomically shaped, two-piece handle fits comfortably in the hand. It facilitates the pump as well as the angled bottom placed back pressure plates on which the feet to stabilize the pump are positioned. Their height of just 75 cm * is the Prime Floor Pump to 5 – 10 cm higher than prior pumps from other manufacturers. Back-friendly: A stooped posture of the pump ends is thereby avoided. One can almost upright perform the pumping operation easier and faster. * When retracted lifting / pumping arm. In addition, is who has to fill different valves and pressures, well advised with this pump. 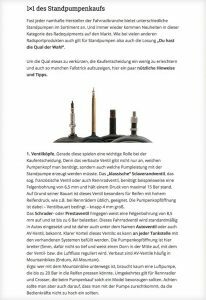 Thus, the PRIME-double pump head is compatible both Presta, as well as for Schrader valves. For still pumping but now almost standard. However, innovation is a small red button on the pump head (predecessor metallsichtiger pushbutton). This allows excess air easily and quickly drain again, taken without the pumping head and the valve may have to be pressed. And also to determine the right amount of air is quite easy thanks to pressure gauge. 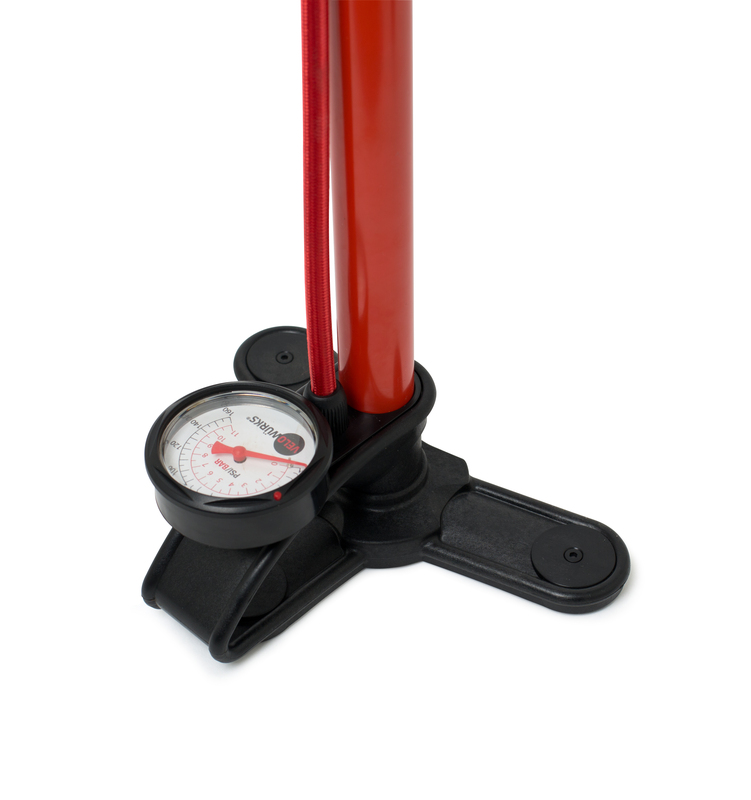 With a diameter of 8 cm, the manometer runs one size larger than other models. In addition, the dial is due to a light background and distinctive colors of the scale to read clearly. The big plus of this pump is the size of the pump plunger. With 65 cm and 3 cm in diameter that runs one size larger than equivalent models. This is associated with a significant power savings: The desire pressure is achieved quickly and easily by means of physical operation, since the piston of PRIME comprises up to 6% more volume per stroke than equivalent models. So can be pumped with the PRIME up to 250 PSI or 18 bar. 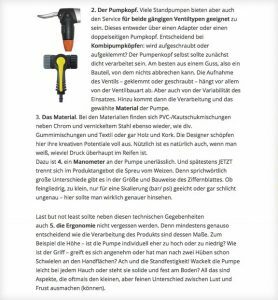 And so the air does not escape as the valve elsewhere on pump head, there is a maintenance plus the manufacturer: the rubber piston seal is manufactured from sturdy HNBR rubber, rubber that is normally used in heavy industry. This ensures a long service life. And would also be simplistic replaceable in case of doubt, the manufacturer. 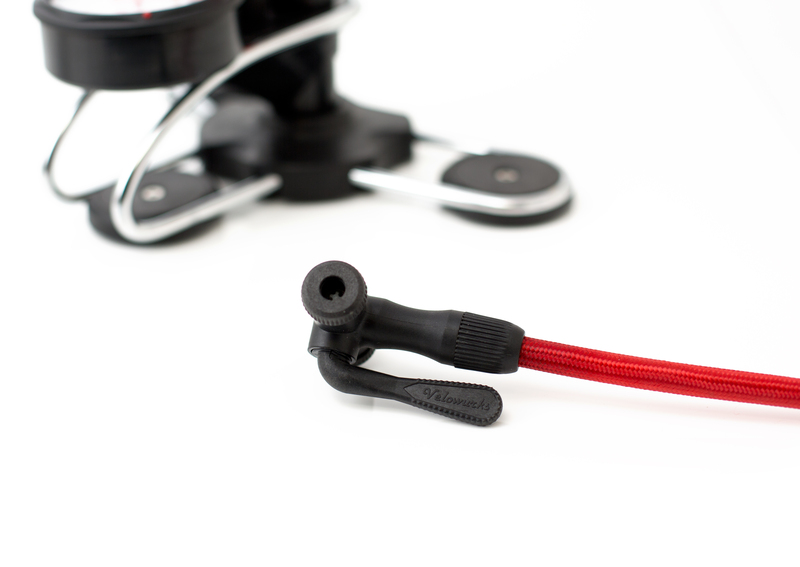 The pump is functionally designed with an eye for detail. With 2400 g of it is located in the upscale weight class; the same applies to the price segment. By default, blank fill two valve systems, the selected material is noble, yet simple as functional and ensured under careful handling of enjoyment for the owner / the owner. Otherwise it is more for lovers of Bauhaus design of the 1920s. So classy and stylish PRIME also looks that face hidden behind it theory of Bauhaus, form over function, the Cyclist remains rather hidden, unless he / she has not explicitly dealt with this. Also ensure that it is a collector’s item, says the price. With just under 120, – € (original around $ 130), the PRIME is located in the upper price range, while about as many comparable prior pump model, for example, SKS TOPEAK, Ergon or Tune. However, speaking for the price, especially the materials used and their accurate processing, as well as the performance of 18 bar and thanks to a larger pump piston up to 6% more pumping volume. We thank the company VELOWÜRKS for kindly providing the test material. 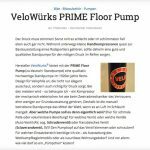 This entry was posted in Floor Pumps, Reviews, Velowurks and tagged floor pump, inflation, Velowurks Prime on March 18, 2016 by Marlow.